The UX name represents the design team’s guiding concept and describes the vehicle’s mission: Urban + X-over (crossover) = UX. 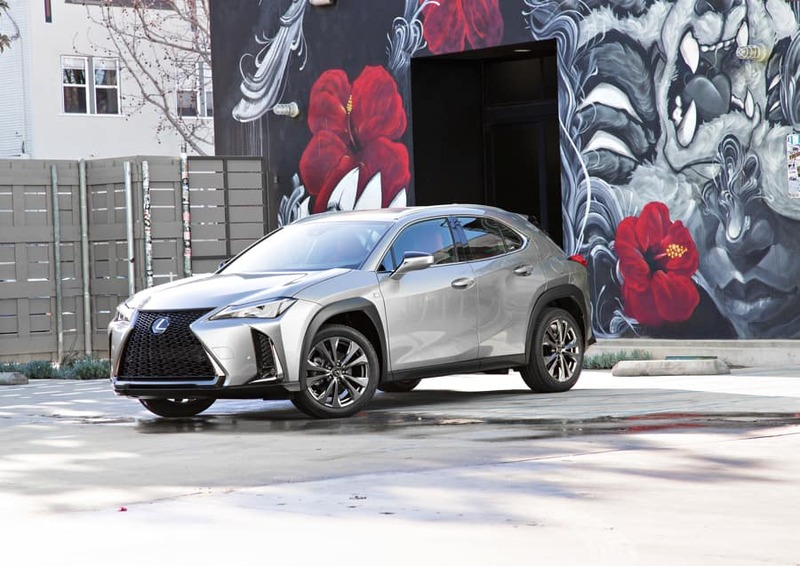 Challenging everything that came before it, the first-ever Lexus UX crossover juxtaposes bold urban design with unmistakable strength. From its uniquely designed taillamp to a striking interior filled with intuitive technology, the UX is expressive from every angle. It also includes innovative connectivity that makes exploration even more seamless. Now you can start your engine remotely with your smartwatch, or start your favorite podcast in your kitchen and finish it on your drive to work with Amazon Alexa integration. While Apple CarPlay compatibility allows you to mirror the same familiar interface from your iPhone on the multimedia display to access your favorite apps like Spotify. 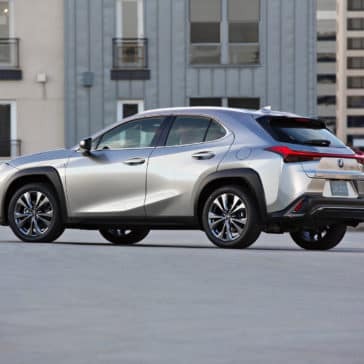 And with performance as dynamic as its design, it touts an all-new chassis and suspension, providing a low center of gravity for enhanced agility. 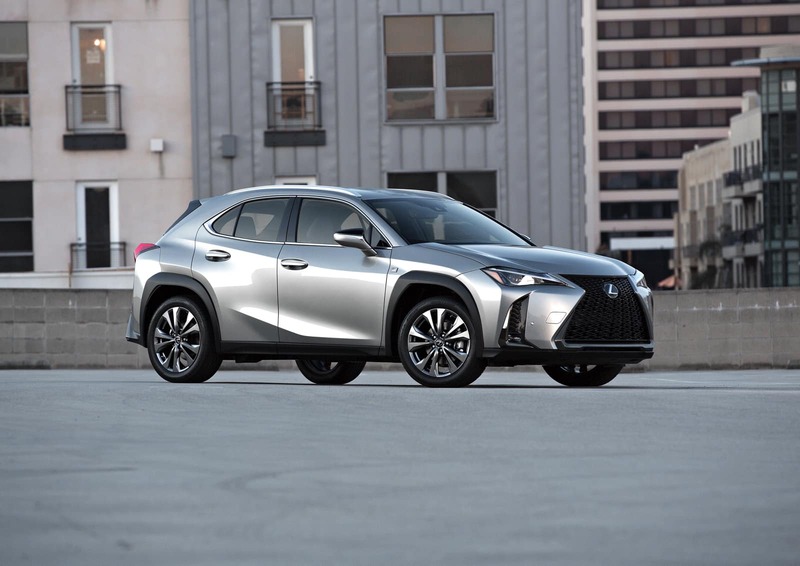 In addition to the head turning gas model, the UX is offered as a more-powerful hybrid model with electronic all-wheel drive, and more aggressive F SPORT versions of both. 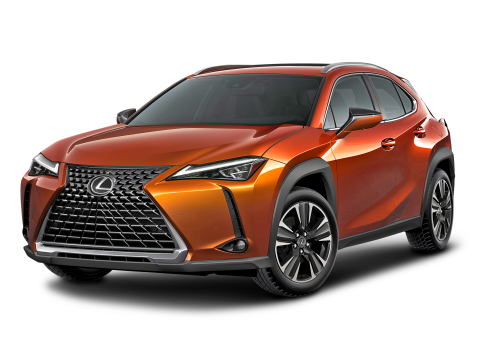 Crafted with cutting-edge style, razor’s-edge handling and leading-edge technology, the Lexus UX has arrived! 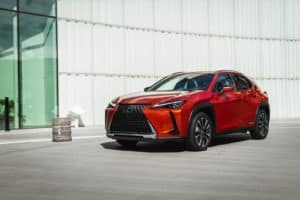 The 2019 Lexus UX is a leap forward in the compact luxury crossover segment. 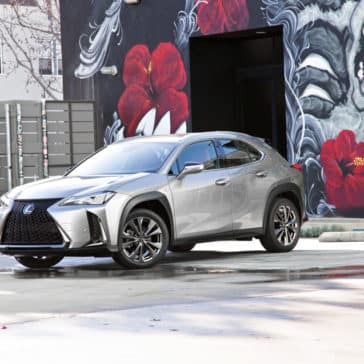 Lexus designers created an overall design theme inspired by a secure, robust look crossbred with the stance of a sports coupe. The headlamp design completes the UX’s face, giving it a determined, confident gaze. Daytime running lights arranged in an arrowhead motif above the headlights complement the Lexus L-shaped lighting signature. These appear like brows above the standard single-projector dual-beam LED headlights or the optional ultra-small 3-projector LED units. The full-width rear lights project a distinctive nighttime signature formed by a sequence of 120 LEDs tapering toward the centre, measuring just 3mm at its narrowest point. The result is a single continuous line of light across the back of the vehicle. The vehicle’s basic form flows out from the lines of the spindle grille to envelop the cabin. Crisp, prominent sculpted surfaces and dramatically flared front and rear fenders reflect the robust inspiration, while an aerodynamic profile, large wheels pushed out to the corners and an impressive front fascia create the agile, sporty stance. Takumi (Japanese for “artisan”) modelers worked with design and engineering to refine all exterior surfaces of the UX. Their work was crucial to refining surfaces down to the 0.01 mm level, pushing the boundaries for what could be produced in the body-stamping presses. 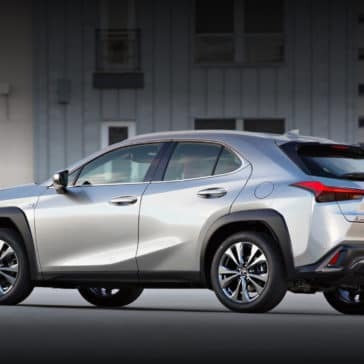 Along with flat underbody covers that contribute to vehicle quietness and fuel efficiency, the wheel arch moldings that protect the body from gravel thrown up by the tires, use airflow over their edges to reduce turbulence and lift, contributing to the vehicle’s stability. In yet another world first, the standard 5-spoke 17 inch aluminum alloy aero ventilating wheels feature Gurney flaps along the spoke edges designed to reduce wind resistance while also increasing the airflow to cool the disc brakes. The design pulls air from the inside of the wheel, while the air flow on the outer side of the vehicle is regulated to follow the wheel surface. 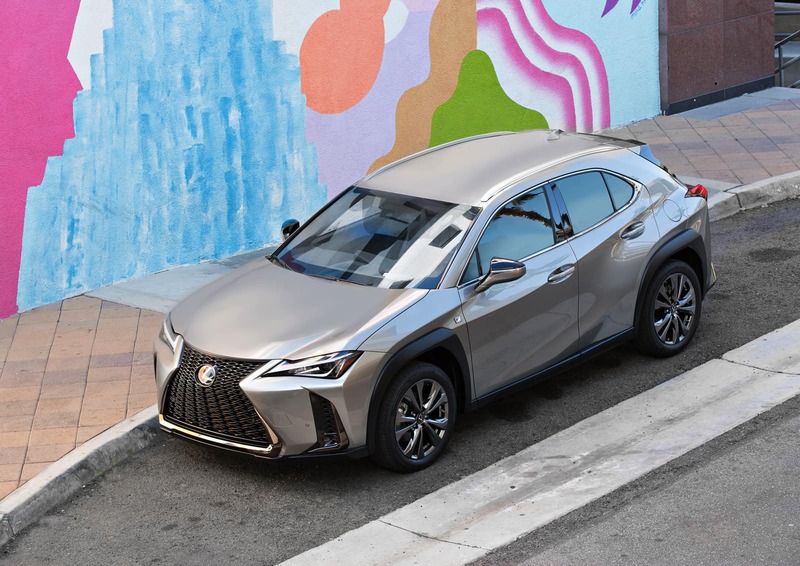 The 2019 Lexus UX is offered in a palette of 11 exterior colours to accentuate its stunning lines. Two of those colours, Ultra White and Ultrasonic Blue Mica 2.0, are exclusive to the F SPORT. Three new colours were developed for the UX: Cadmium Orange creates vividness and a sense of depth using a multi-layer painting process that combines a red colour base layer with a yellow interference mica layer. Nori Green Pearl offers a strong contrast between bright highlights and dark, calm shades. The mica particles have been enlarged as much as possible without creating colour unevenness, achieving high brilliance while expressing toughness. The F SPORT package is available for both the UX 200 and UX 250h. 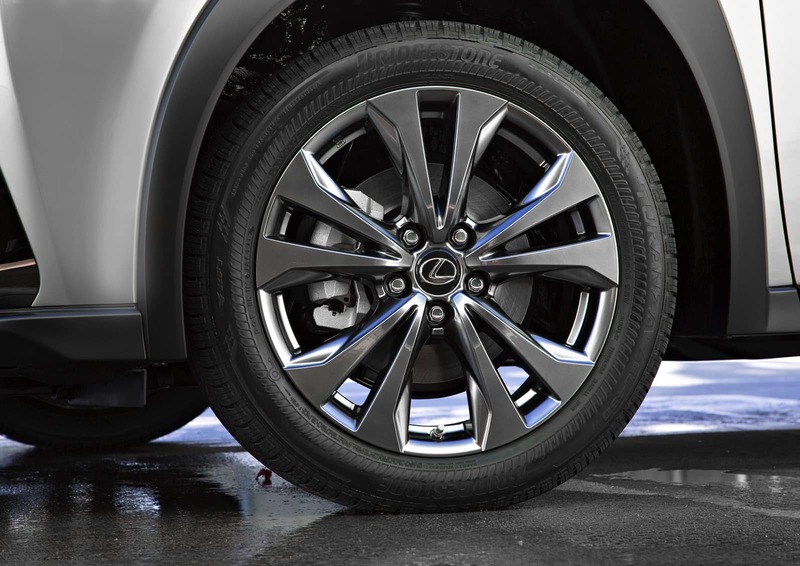 The 18 inch, five twin-spoke aluminum alloy wheels unique to the F SPORT are even more rigid than standard UX wheels, contributing to responsiveness and handling agility. 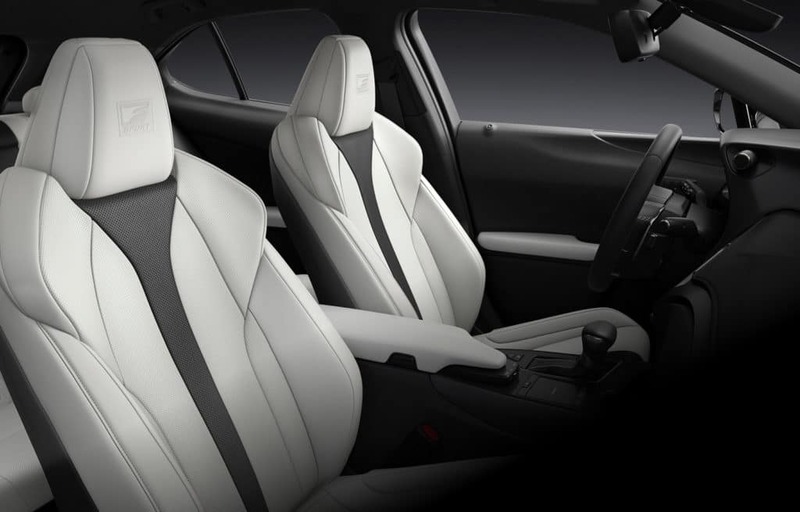 F SPORT-exclusive interior features include front sports seats made with a highly supportive integrated-foaming technique first developed for Lexus F models. A leather-covered F SPORT steering wheel, leather-trimmed shift knob, aluminum pedals and footrest are also part of the package. The F SPORT UX features a larger 8‑inch TFT LCD display that varies depending on the powertrain (gas or hybrid) and the selected drive mode. 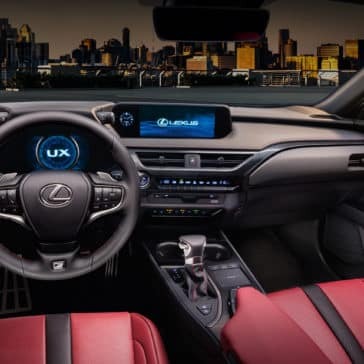 The movable meter ring, which originated in the Lexus LFA supercar and is also featured in the LC premium coupe, allows displayed content to be easily changed: pushing a switch on the steering wheel moves the ring to the right and enlarges the multi-information display. The UX F SPORT driving experience can be further enhanced with Active Sound Control (ASC), which generates the aural effect of up- and down-shifts like those of a geared automatic transmission. At the same time, the UX interior design creates a sense of security suggested by the exterior’s inspiration. As one example, the form of the interior door shoulders evokes a robust frame, expressing a secure feeling inside the vehicle. Designers created a feeling of seamless continuity inside the UX. From the driver’s seat, the upper plane of the instrument panel appears to extend out beyond the windshield into the hood and fenders giving the driver an excellent field of vision and a clear sense of the vehicle’s dimensions and tire placement. When viewed from outside the vehicle, the hood appears to connect directly to the instrument panel through the windshield, blurring the boundary between interior and exterior. 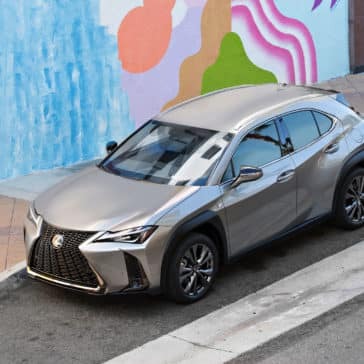 Typical of Lexus, the UX offers a very quiet driving experience, thanks to the high-strength structure and optimal placement of specially designed sound-absorbing and insulating materials throughout the body. Also in typical Lexus fashion, engineers traced noises to their sources to keep them out of the cabin. Even the sound of water being thrown by the tires is reduced. 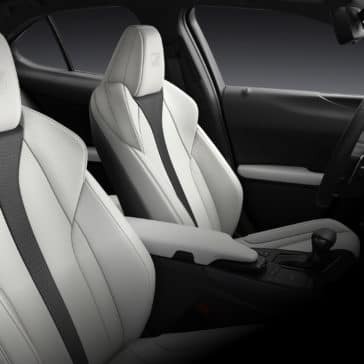 The UX offers a 8-way power adjustable front seats, the latter with adjustable lumbar support for the driver. Front seat cushions use springs and foam specially designed to gently envelop occupants while uniformly dispersing pressure under the occupant’s sciatic area. 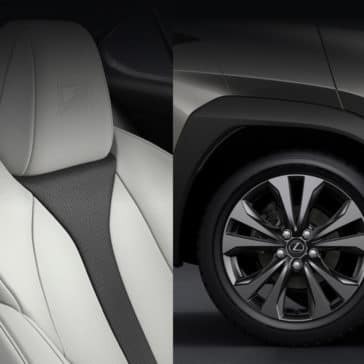 Each interior colour on the Lexus UX conveys a specific mood and accentuates the premium design. The seating is synthetic leather. The standard models offer a choice of three colours, including: Black, White Ash, and Ochre. 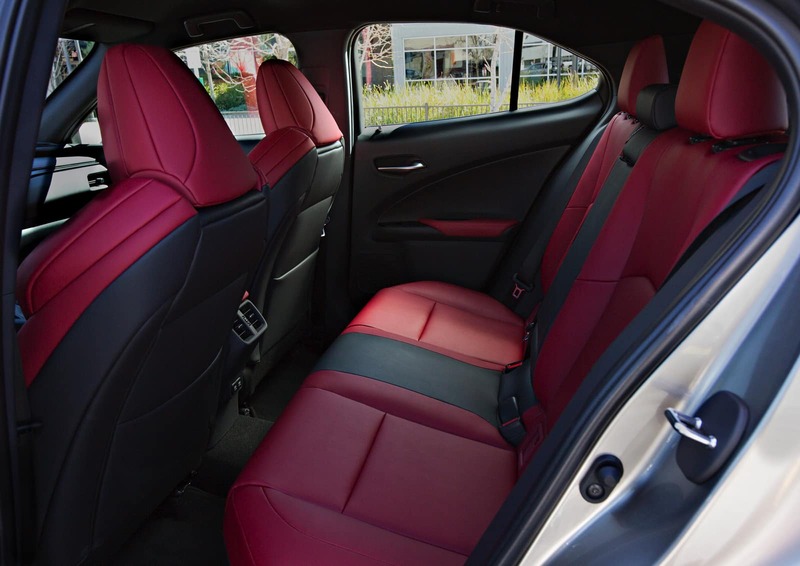 In addition to Black, the F SPORT also offers exclusive Flare Red or White seat colours. The sweeping instrument panel and cabin trim offer a choice of two different grain patterns and four colours. 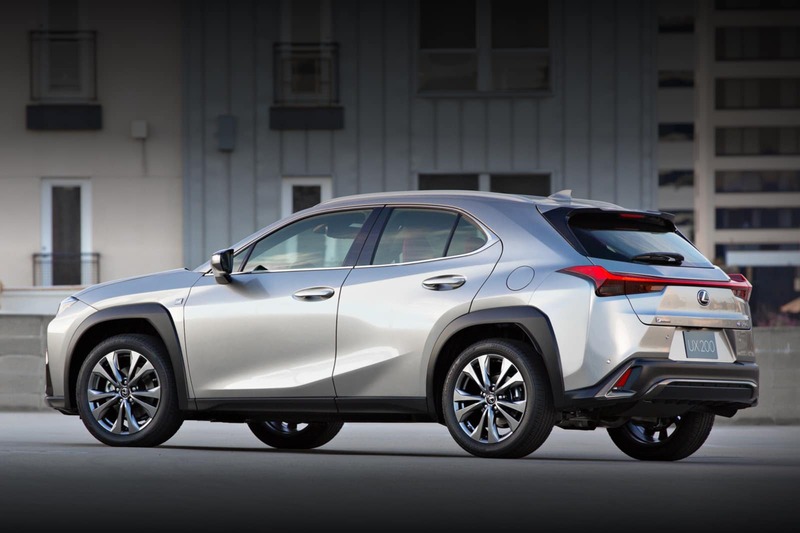 In a Lexus first, the UX offers a new trim finish inspired by the grain of Japanese paper, known as washi. It’s common in traditional Japanese homes and it evokes a calm and warm feeling. A leather grain finish, also featured in the Lexus LC coupe and LS sedan, is also available. 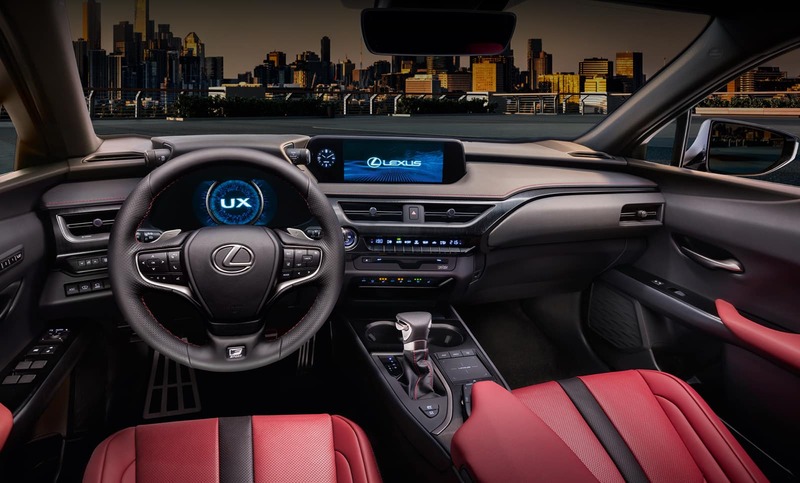 The UX instrument panel design combines unique Lexus traits and intuitive technology. A 7 inch TFT LCD display meter digitally creates realistic, analog gauges in a three-dimensional space. 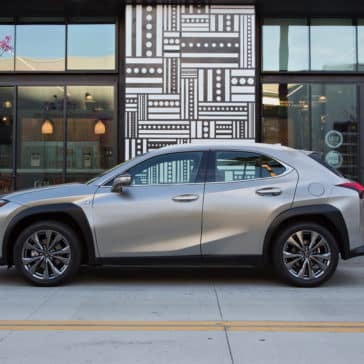 An available head-up display underscores the Lexus UX’s high-tech feel while putting vital vehicle information in the driver’s line of sight. The large colour display projects the information to a virtual “screen” 2.5m in front of the driver, making it easier to focus on the display as well as objects in front of the vehicle. The bright, high-contrast display is easy to see in daylight and in snowy conditions. 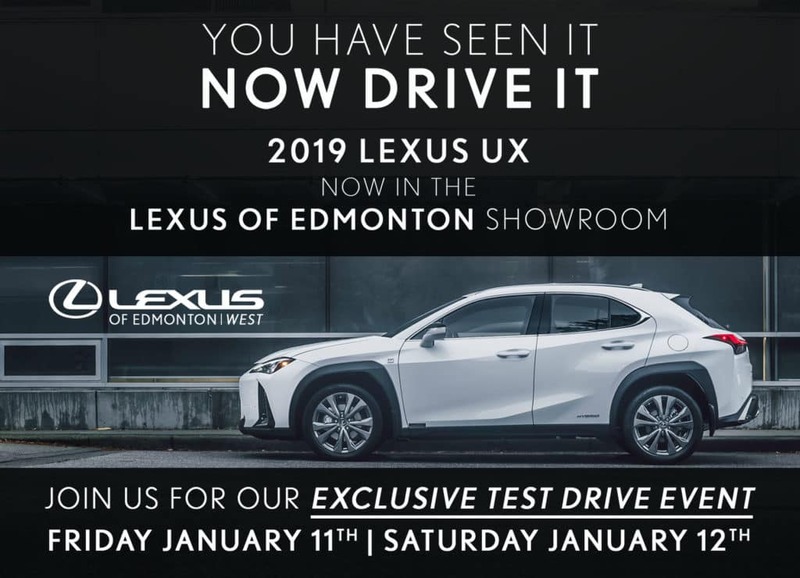 The Lexus Remote Touch Interface (RTI) with haptic feedback in the 2019 UX is designed to feel as familiar to use as a smartphone. The RTI utilizes intuitive operations, such as double-tapping, squeezing to zoom and flicking, to mimic common phone gestures. The touchpad can recognize Roman block letters when typing a search name. Touchpad surface haptic vibrations indicate to the user when the cursor is moved, making it easier to align the cursor with the desired function button. Frameless construction eliminates edges, and a special coating on the touch pad surface lets fingers easily slide over it while minimizing the appearance of fingerprints. 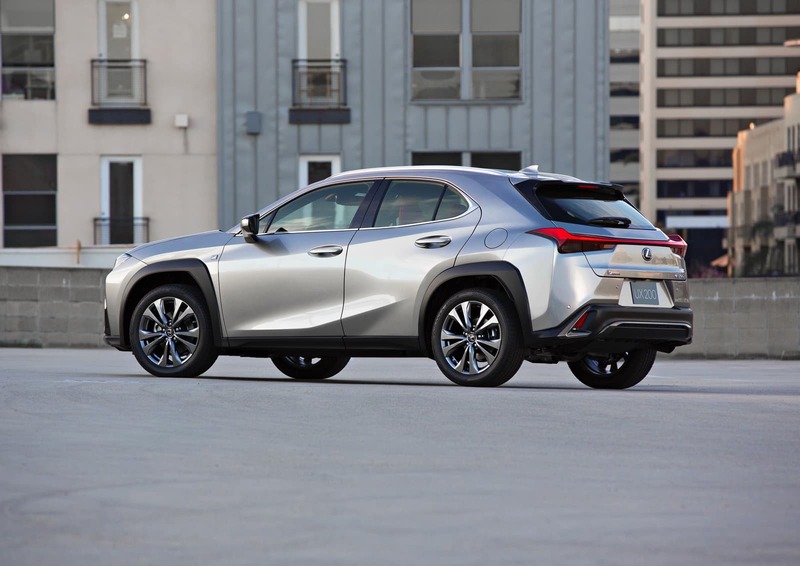 Lexus designers created a cabin atmosphere with a “wow factor” and depth of quality that will be especially apparent to those buying a luxury-brand vehicle for the first time. LED cabin lighting is one example; white LEDs illuminate the front footwells, glovebox and console switches, and also serve as the dome light, map lights and cargo area light. As another example, each of the UX’s air vents uses a new single-knob control for airflow direction and volume; by combining the two functions in a single control, the air passages of each vent could be enlarged, improving airflow while reducing noise. Luxury-grade models feature illuminated vent controls with distinctive LED light sources wirelessly powered by electromagnetic resonance of two adjacent magnetic coils vibrating at the same frequency. The vent control LEDs use mirror optics in the same design principle as the Lexus LC’s tail lamps to create the effect of deep floating light sources, even though the light element is just 3mm thick. 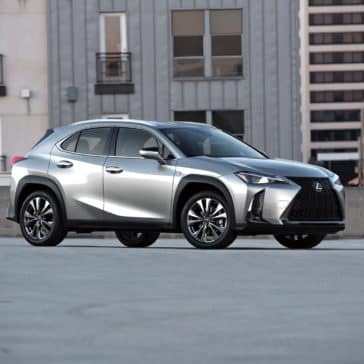 The Lexus UX offers the brand’s renowned luxury and comfort in a package ideally suited to making urban exploring easier in cities around the globe. A 2640mm wheelbase contributes to a smooth, stable ride and cabin roominess. 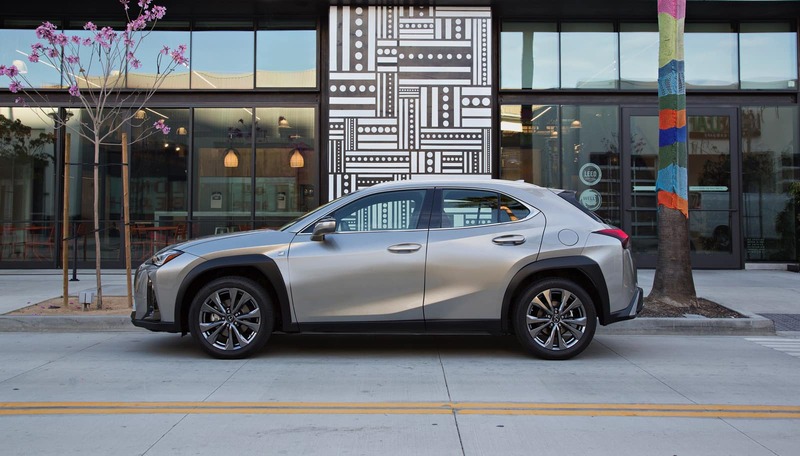 The 4495mm length and best-in segment 10.4m curb-to-curb turning diameter help make the Lexus UX easy to maneuver and convenient to park. 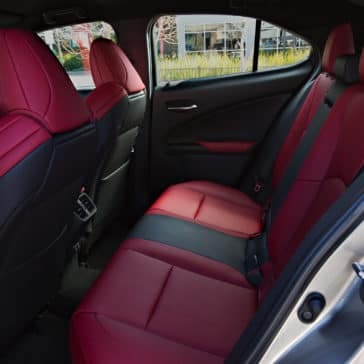 Getting in and out is easier thanks to factors including optimal placing of the hip-point, a cut-off profile for the rocker panel below the doors, and the shape of the seat cushion. For interior storage, the UX offers a large console box. The rear luggage area offers high- or low-deck floor versions depending on the model with underfloor storage in both. Fold-down grocery bag hooks remain flush with the side panel surface when not in use. All UX models offer a standard power moonroof. An available hands-free power rear gate makes loading the UX more convenient, and solid aluminum roof rails allow installation of a variety of accessory carriers. 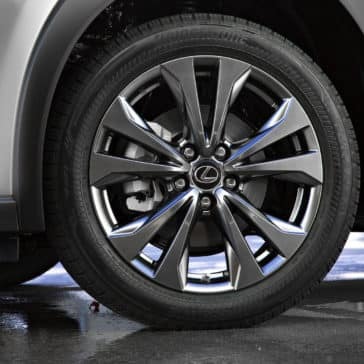 Depending on model configuration and tires, the UX features a spare tire, a repair kit or run flat tires. Newly-developed 2nd–generation run flat tires are quieter and more comfortable than previous designs, while now allowing driving with a flat tire at speeds up to 80 km/h for up to 160 km. 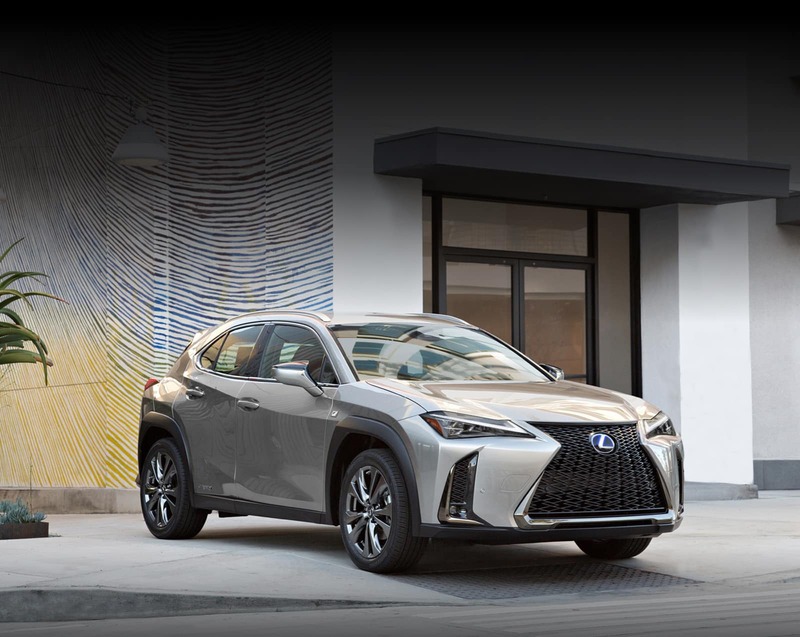 The 2019 Lexus UX models offer the latest in the brand’s multimedia and navigation technology. A 7-inch EMV (Electro Multi Vision) display is standard, and a 10.3 in. EMV display is used with the available Lexus Navigation system. The standard 6-speaker system and available 8-speaker upgrade system use bamboo charcoal speaker diaphragms to reduce mass and deliver natural-sounding voices and improved mid-range sound. Both systems create a more lifelike soundstage by using tweeters mounted at the sides of the instrument panel reflecting sound off the windshield. The 8-speaker system adds a centre-dash tweeter, a subwoofer mounted in the luggage area and a more powerful amplifier. The Lexus Enform App Suite allows linking of smartphone apps. Apple CarPlay® allows easy iPhone integration using the vehicle’s display, expanding multimedia capability. Instant Replay allows the user to capture SiriusXM® content for later playback. Dynamic Voice Recognition allows natural voice commands. USB Video and RealMedia video formats are supported. Favorite Genre for FM and SiriusXM® allows the user to select a preferred music genre to discover new stations. 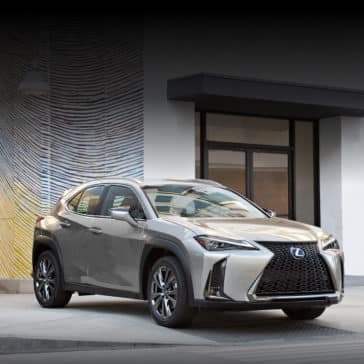 The available Lexus Navigation system features the brand’s latest graphical user interface for greatest ease of use and access to features.